In the tropical countries such as Malaysia and China, Indonesia and other countries access to the forest areas is often difficult and forest information is inadequate. Remote sensing in forestry is very valuable and it has become important due to its capability to collect data from large areas and its capability to generate information. 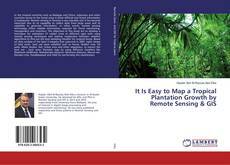 In other words, remote sensing technology offers reliable information essential for forest monitoring, management and inventory. The objectives of this study are to develop a technique for estimation of rubber trees at different ages with using remote sensing techniques and making comparison between classifier algorithms to find out the best satisfying classifier for tropical forest. Based on data analysis of the Spot 5 imagery that captured in 2007, eight classes of land cover- land use were classified such as Forest, Rubber tree, Oil palm, Water bodies, Soil, Urban area and other vegetation, to extract the land use - land cover thematic map by using different classifiers like Maximum Likelihood, Mahalanobis distance, Minimum distance, Neural net, Decision tree, Parallelepiped and SAM for performing the classification.